Rosemary Appetiser Skewers - Nisbets Australia Blog - Industry news, trends, recipes and more! Appetisers are a great way to get you ready for the main meal. And these Rosemary Appetiser Skewers certainly set the bar high for the dish that follows. The piney aroma and earthy flavour of the rosemary is a welcome clash to the freshness of the tomato and rockmelon. It’s certainly an eye-catching piece. And it’s so easy to change the ingredients. 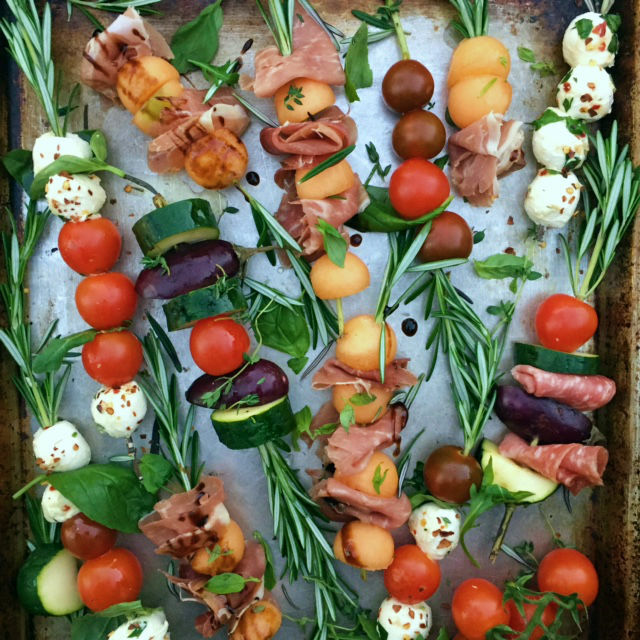 "These skewers are a great way to add a variety of flavours to any dinner party. They're easy to make and it's easy to change the ingredients." - Chef Rick Tarantino, M.S. Use a melon baller and scoop rockmelon to form 13-15 balls. Remove half to 2/3 of the rosemary leaves, leaving some at the top. Layer prosciutto, rockmelon and if desired, additional herbs. Dress mozzarella balls in a mixture of various herbs, crushed red pepper and olive oil. Layer mozzarella, tomatoes and basil leaves. Grill mixed vegetables for roughly 3-4 minutes, or until tender. Layer meats and assorted vegetables. Garnish with extra virgin olive oil, truffle oil and/or balsamic vinegar. Salt and pepper to taste. You can also grill or broil the finished rosemary skewers to enhance the flavour. On a platter, arrange the skewers so they look slightly rustic. Sprinkle herbs and drizzle with additional olive oil, if desired. Tun this into an Asian fusion appetiser instead: grill 250g prawns and drizzle with 2 tablespoons wasabi mayonnaise. Garnish with scallions and crushed peanuts. Add extra fun and flavour with fried mozzarella. Dredge mozzarella in an egg wash and breadcrumb batter, then fry. Serve with 100ml of marinara sauce and garnish with basil. Serve this as a side. Adjust serving size to 2-3 skewers, and serve them alongside an entrée.